My friend Narumi and I started organizing Japanese cooking classes for foreign visitors in Tokyo. We used to organize a group where Japanese and foreigners (women and their kids) could enjoy chatting, have a party to exchange ideas, and help understand each other. We have had a good experience with cooking dishes for our families, and we can communicate in English. We can provide a good and enjoyable experience for foreign visitors. If you are interested in visiting Tsukiji Market, we also help because our kitchen is near Tsukiji and Ginza! My 13-year-old son and I had a wonderful time! As soon as the booking was confirmed, Kimiko-san and Narumi-san were prompt in communicating with me to discuss what recipe we would cook on the day, and to give assurance that we would be met at the station. On the day before, there was also a friendly reminder and more detailed instructions about the meeting point at the station. As promised, Narumi-san met us at the meeting point and we were lucky to get a ride from Kimiko-san's husband. It was interesting to be able to have the class at Kimiko-san's apartment as it gave us an opportunity to see how some locals lived. We were very much at ease with Kimiko-san and Narumi-san - both spoke beautiful English and were very warm and also great conversationalists. 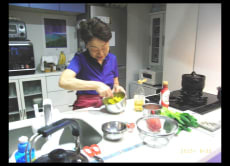 Once Kimiko-san realised that my son was interested in cooking, she patiently guided him through the food preparation and cooking. She also took care to explain some of principles of Japanese cooking and presentation. We got the chance to learn not just how to make Japanese curry, but also tofu salad with seasonal vegetables and a jelly-like dessert. After lunch when we got to eat what we made, the two ladies kindly brought us to the supermarket across the road to show us the range of curry roux so we could pick up some to try replicating the recipe we learnt at home. Narumi-san then took us on a short walk back to the station. All in all, it was a most delightful experience- highly recommended! Last minute addition to the itinerary, and they kindly accommodated me. Oh I had a fantastic time here! I was met at the train station by Narumi, and we walked over to the apartment together where we would be cooking. I was floored by how stellar the communication was: I received an email beforehand asking me what types of dishes I would like to learn to cook. Naturally, I chose a deep-fried pork cutlet so I can bring it back to my home and eat it here. Kimiko was an excellent host. She already had all the ingredients set out for me, and we cooked while Narumi took pictures (great souvenir!). At the end of our session we ate our creations too. Kimiko’s husband kindly drove Narumi and I back to the train station so I wouldn’t get lost. This was definitely a standout experience, one of my favorites in Japan. I only wish I was in town for longer so I could do this multiple times. The apartment itself is also very conveniently located so there’s plenty to do around the area. We had a great time learning Japanese cooking! Recipes were simple enough, food was delicious and our teachers were very friendly.😊 Very nice experience! Definitely, I will repeat the experience and learn more tasty Japanese dishes with you. Thank you for your help in getting to your place and also for the nice lunch together.